Your 30 minute air experience starts with a briefing from one of our instructors. During the briefing you will be able to discuss where you would like to fly subject to any ATC restrictions. 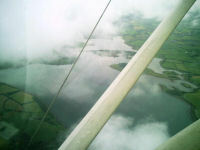 For example you could fly south from the airport flying over Strangford Lough and continuing south before turning north over the Ards peninsula and back to Ards. Once airborne you will have the opportunity to take control of the aircraft (Cessna 152) and enjoy the sensation of flying whilst sampling some of the most breath-taking scenery in the British Isles. All too soon it will be time to hand back controls for the landing. Max weight 12 stone (77KG).